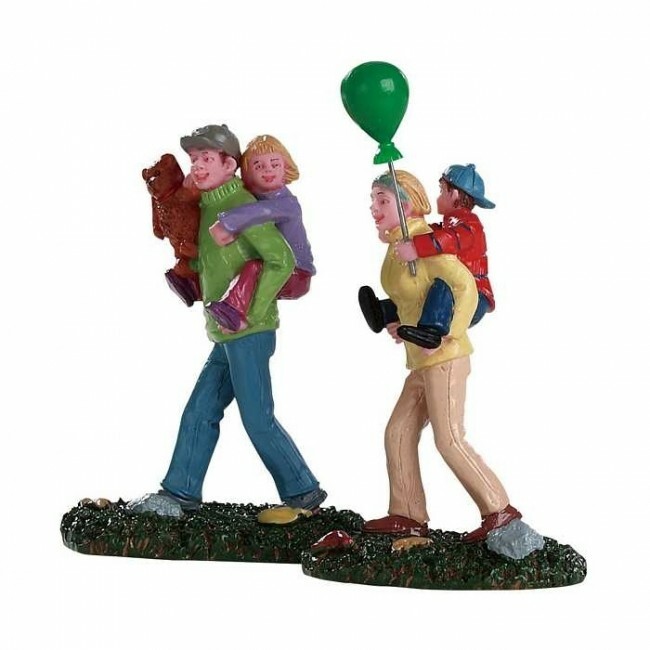 Lemax Coming Home From The Fair Figurines (Set of 2) depicts a young family on a happy return walk from the seasonal fair with a Son and Daughter enjoying being carried on their parents shoulders. Young boy is holding his balloon, whilst the girl is carrying a cuddly toy. Popular seasonal Lemax Village miniature piece which joined the Carnival Lemax Village themed range in 2018, suited for placement in a Lemax miniatures display. The Coming Home From The Fair comprises of multiple individual hand painted polyresin figures on two individual bases to compliment your seasonal Lemax Village display.